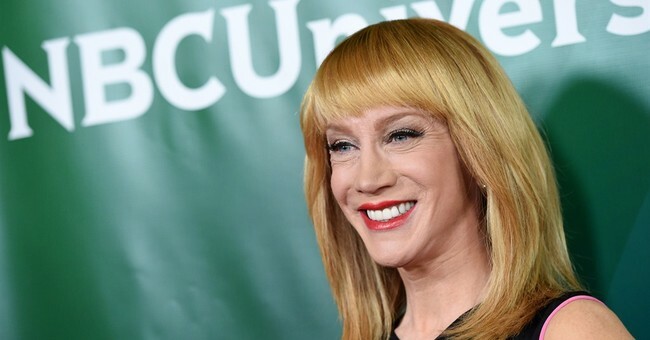 Comedian Kathy Griffin's seems to have done the impossible: she's united the U.S. against her tasteless photograph holding the bloodied dismembered head of President Donald Trump. Since the photo was posted by TMZ, people as politically different as Mitt Romney and Chelsea Clinton have condemned the image--and the Secret Service has said that they're aware of the threat. I think Trump is a DISASTER as both a President and a human being. I also think that Kathy Griffin photo is horrible and wrong. Good. I'm glad people are stepping up to condemn this completely unacceptable rhetoric. It has no place in American politics, even if it is Constitutionally protected. It wouldn't be okay if it were a conservative doing this to a Democrat, either.